Hi friends! Welcome back to DIY Summer School. Your teacher has been snoozing between classes! We just got back from a super-relaxing vacation in Minnesota where I got to see both sides of the family, linger on the lake, and visit my great-grandfather's homestead. I hope your summer has been equally lazy. 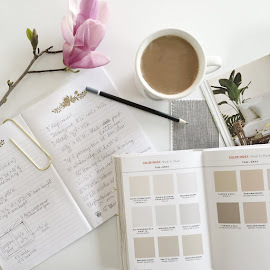 Today is Wildcard Day in our series, hosted by Beth of designPOST Interiors, and I thought it would be fun to show you the latest app (not technically an app) that I've been having fun with these days. 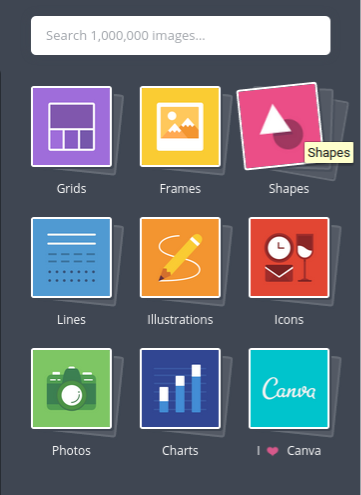 In the past, I've showed you the apps I've used to make typographical posters, free artwork and pet portraits, and to edit photos. (Great spot to insert those graphics, right? I thought so). Today I'm showing you a new web-based site that does all of that and more. 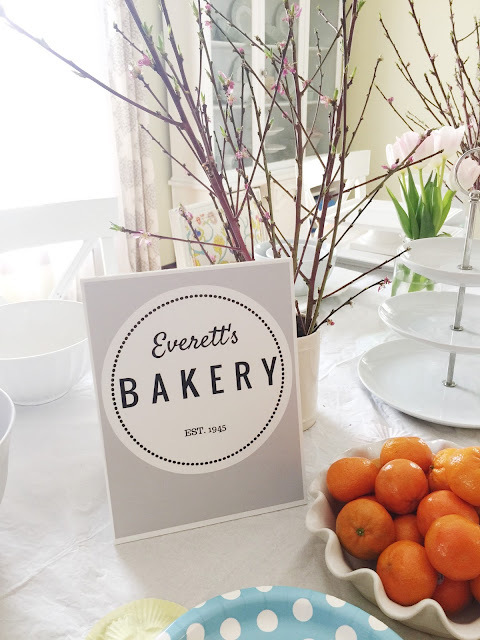 I'm going to show you how to make a cute personalized table sign for your next party, but trust me when I say that's just the tip of the iceberg. 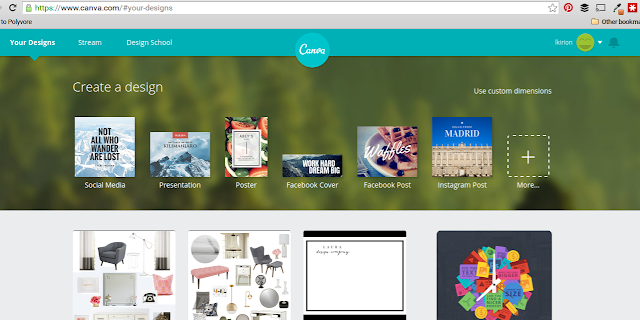 The site is called Canva, and as with absolutely all and any tech-related wins I've had, this one was recommended to me by Travis Hickox. It's only fitting then that I made today's DIY for Travis' wife Steph, who threw an adorable bakery-themed bash for her one year old this Spring. Auntie Laura (that's me) got to make the table signage and it turned out soooo cute! 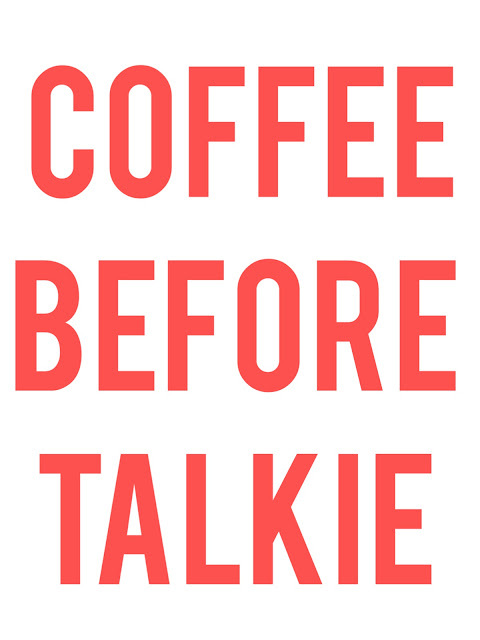 I'm going to give you a long-winded tutorial of how I did this sign using Canva, and you'll definitely want to prepare to be overwhelmed by the capability of the site. There are a bajillion options and you could spend a looooong time exploring. Once you get the hang of it and sift through the infinite choices, it can become your go-to source for any project in this genre. Think menus for your kids' playroom kitchen, blog graphics, client presentations (like all these mood boards I've made with it), invitations, twitter banners, personalized greetings, posters...it's endless. 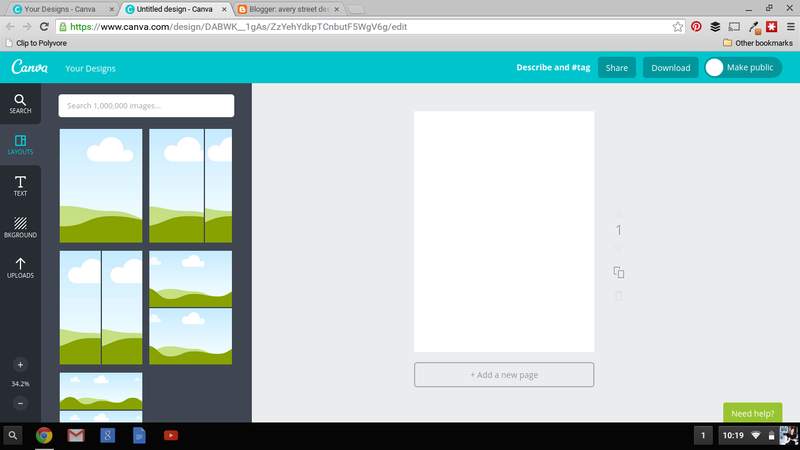 It's www.canva.com. I'll wait here. At the top right, there will be a choice that says "Use Custom Dimensions." I almost always do this, even though I really have no idea what I'm doing or what px means. I always choose something like 900 x 1200. It works. Over on the left, start by choosing the big "T" for "Text." It's fun because you will immediately get excited about how many cool graphics you have the option of using. You click on that and it will immediately be imported into your project, shown above. 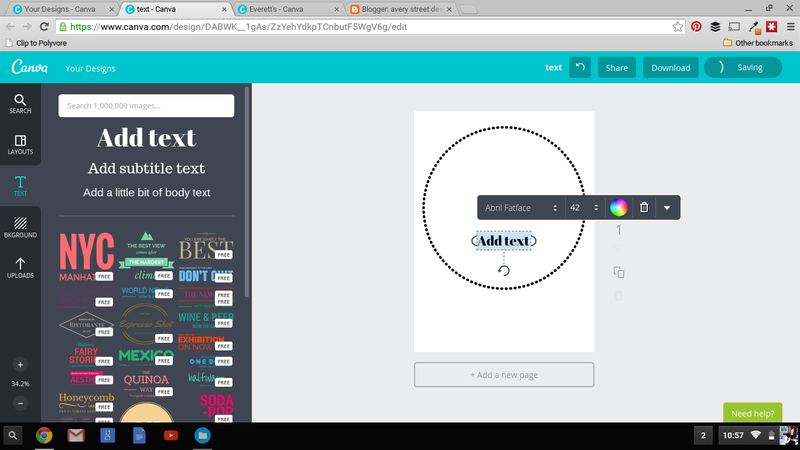 You can change the size by dragging the corners, and change the color of both the dots and the circle itself by clicking the green and blue circles in that little pop-up tool bar above the graphic. 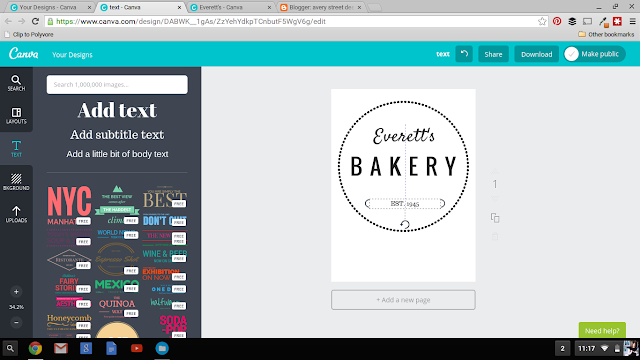 Change the text to whatever name you want, the font style to "Satisfy" and the size to 72. You can change the color if you wish but I just left it black. I like to change the alignment to "center" by clicking on the drop down arrow on the right of the little tool bar. It makes it easier to know you are lined up straight later. You can then move the text by dragging it to the top of the circle. 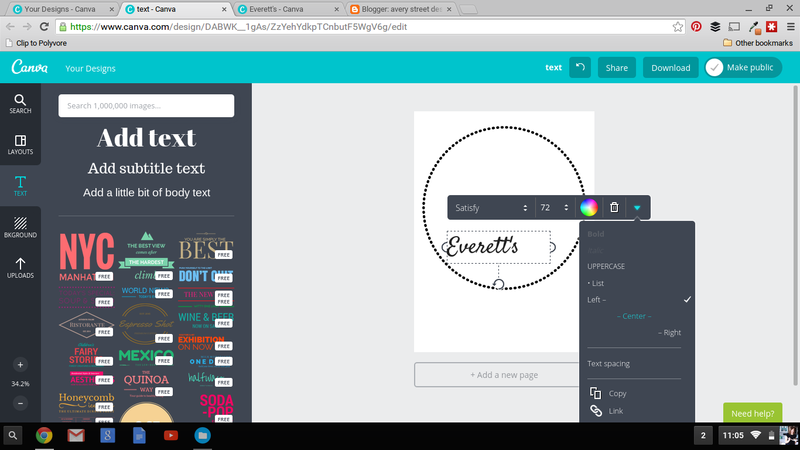 Now you follow the same steps to add the other words in the circle, using the font styles and sizes listed above. The only thing you need to do differently is to increase the text spacing on the word in the middle. Use the arrow at the right of the toolbar to bring up your drop down menu, and choose "text spacing" - you can use the slider to adjust until it looks right and fits well. Mine was at 340. Add all your text and move it around until you are happy. Place your cursor on your design somewhere outside the circle so that the circle is not highlighted. Go over to background on the far left side and click on it. 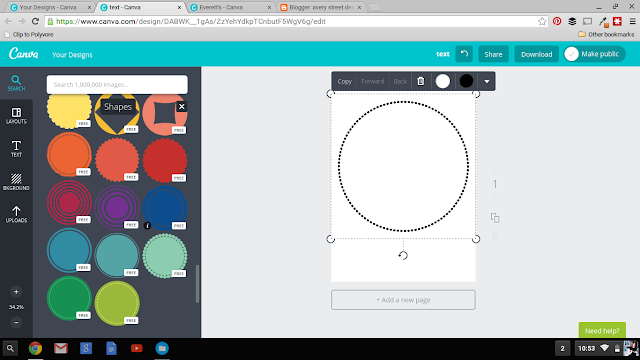 A row of circles will be at the top, and you can choose the one with the plus sign. 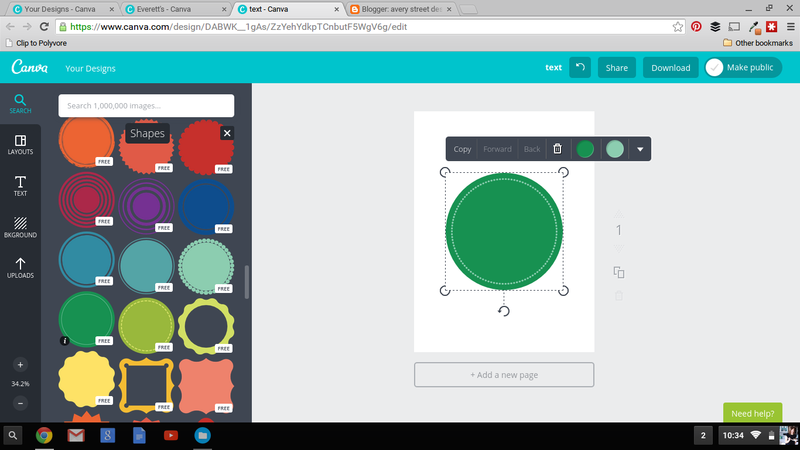 It will then let you add a custom color. You can play and adjust, or type in a hexidecimal code directly. My grey color is d9d9d9. 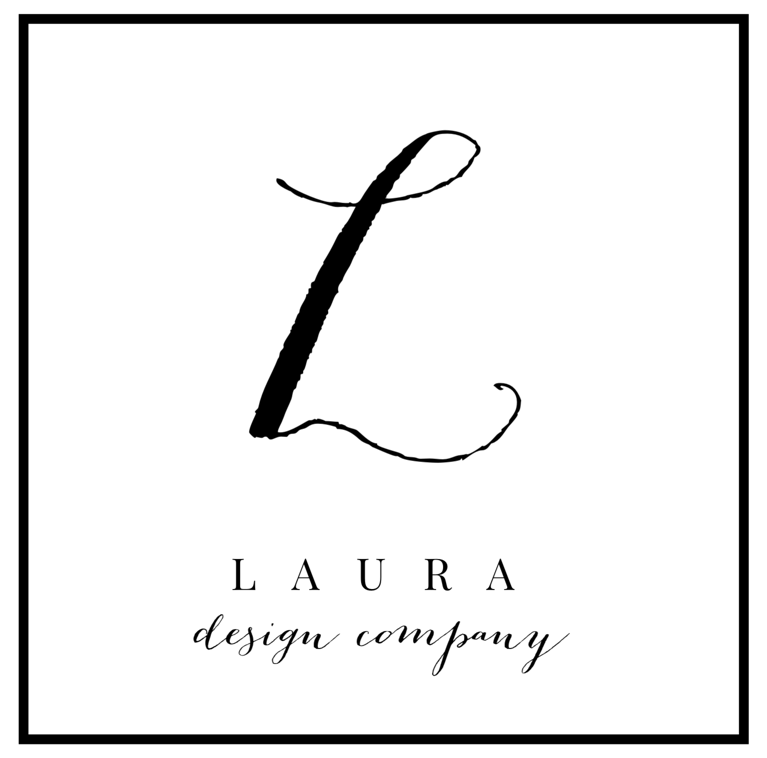 Your design is done! If I read a post like this, my eyes are glossed over at this point. I promise, it looks more complicated than it is once you get used to it. You will have to play around, but if you are interested in these kinds of things, it's worth it. Once your design is just how you like it, click the "download" button at the top right of the screen. It will give you the choice of PDF or image and either is fine. I usually choose image. 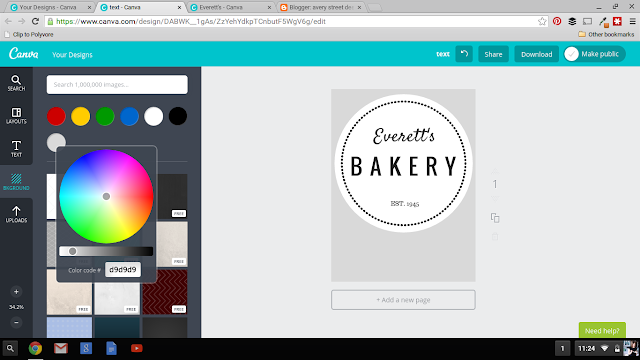 Every once in a while, Canva still gets super glitchy and makes you want to cry. Your design looks right on the screen, but the saved download is messed up. I've found that if you make sure your design is saved, close out of it, then go back in and edit something little, and save again, it usually corrects itself. This can be super frustrating but it's getting a ton better and I have full hope that they'll fix it completely soon. Then you can print to your printer at home or save it to a flash drive and take it somewhere that does stuff like that. Side note, I don't know what the whole "make public" thing is about- I have it set up so my designs are private (I hope, ha!) and I haven't tried sharing anything yet. I didn't have a frame to show my print in, so I actually printed two and glued them to either side of a thick piece of Canson paper. If you go to Hobby Lobby, you will find cubbies full of different kinds of Canson paper over by the custom framing section; It's like photo mat paper. There are several weights and I got a large sheet of the very thickest. I laid both prints end to end and traced them onto the paper, then cut out the rectangle with an exacto knife. You can score the middle line so that you can fold it into a sandwich board without it breaking in two. Then glue the prints on either side with a glue stick. Make sure you don't have one upsidedown! You can then display your sign on your tablescape or dessert buffet. Speaking of dessert buffets, do I get to tangent and brag on Steph for a second? 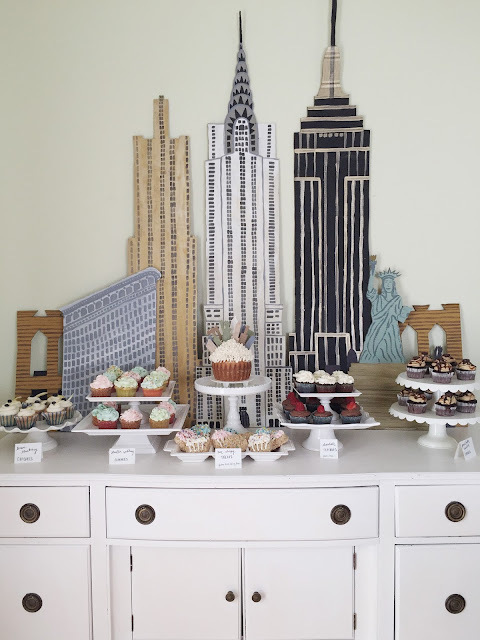 She hand painted each one of these buildings for her dessert table backdrop and handmade ALL of those scrumptious cupcakes. (I had the one with the peanut butter chocolate thing in the middle and it was the best cupcake I've had in my whole life)! This girl can be my substitute teacher at DIY Summer School anytime. Well now that you've been a very patient and attentive student, and are craving cupcakes in the worst way possible, let me send you along to your next DIY class. You have a great batch of teachers ready with their wildcard projects, and I can't be sure but rumor has it your hunger pains will worsen before school is out today. 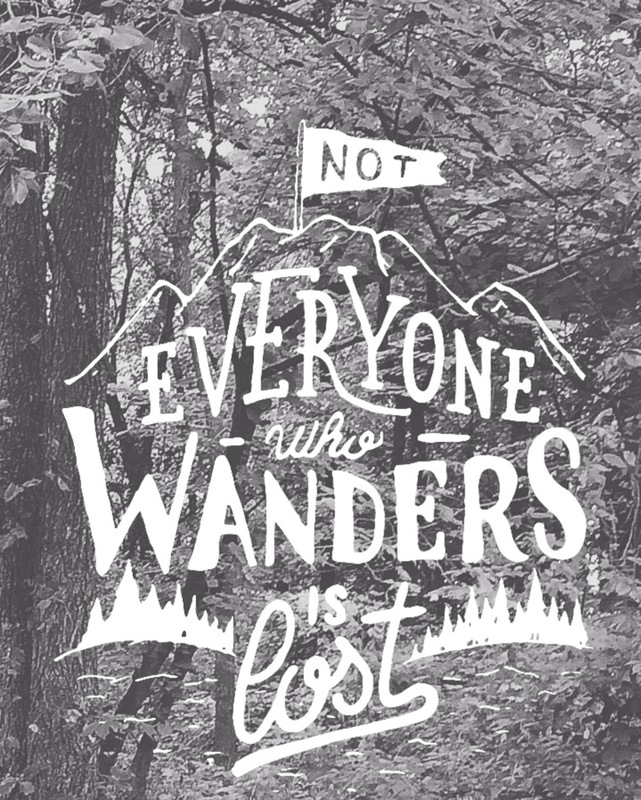 And hey bloggers! 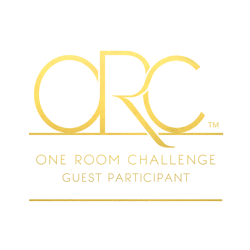 There's a spot below for you to share your projects with us too! 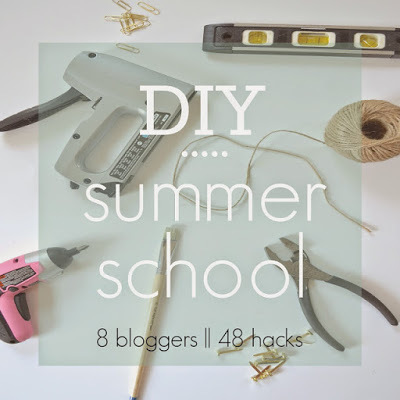 Link up anything and everything DIY this week- it's Wildcard so anything goes. We love to see. 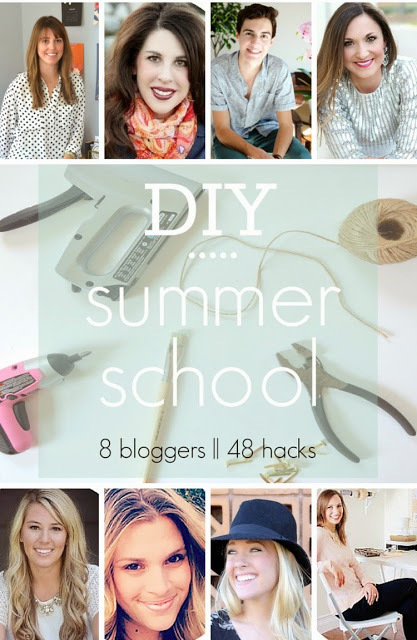 And blogger or not, you can share on Instagram with the hashtag #DIYSummerSchool. I'll see you next time! Disclosure: I am not being compensated for this post. Canva doesn't know I'm writing this post. I just really like them. As always, I only recommend products or companies to you that I would share with my best friends at our weekly playdate. What a neat-looking program! Love how your prints turned out, so fun and personal! Okay I happened to come across your post about editing insta posts with vsco yesterday!! I love this one too. I have heard of Canva but haven't tried it yet. This will be so helpful!! Thanks for the tips! How funny! I haven't thought about that post in a long time (isn't it weird to read old ones?!) 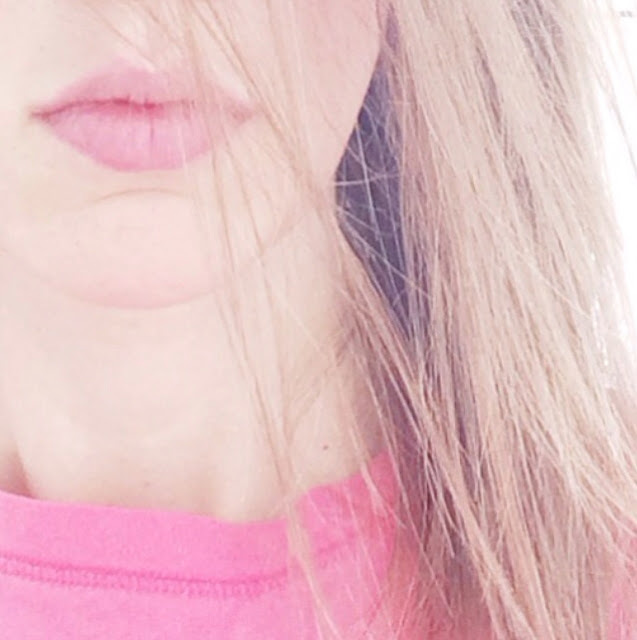 but I still edit everything with vsco! It just keeps getting better. Adorable party! My intern has been raving about Canva but I have been a little gun shy. I am totally going to give it a try now!